Designed from the ground up to be an affordable and secure storage array, the 5C 5-Bay USB 3.0 Type-C Enclosure from Drobo is equipped with five 3.5" SATA drive bays that support SATA III 6 Gb/s and SATA II 3 Gb/s drives. Using separately sold drive carriers, the 5C will also support 2.5" hard drives and SSDs. The Drobo 5C distinguishes itself from the other members of the Drobo "5" series through its single USB 3.0 Type-C port, which operates with data transfer speeds of up to 5 Gb/s. To facilitate data protection, Drobo's BeyondRAID technology enables single or dual-drive redundancy. If there are any empty drive bays, BeyondRAID allows additional drives to be inserted into the array, where they would be automatically configured. If all drive bays are occupied, simply replace the smallest capacity drive with a larger one and BeyondRAID will handle the rest. BeyondRAID is also what allows drives of varying capacities to work in the same unit, which helps enable future expansion as larger drives become available. Additional data protection is provided by the included rechargeable battery, which helps protect data stored in the 5C's memory or cache. If there were to be a sudden power loss, the battery allows the Drobo to stay powered long enough for the cached data to be written to an included internal SSD. Cooling is provided by a 120mm variable-speed fan and once installed, the hard drives can be configured to spin down when they're not in use, helping to further reduce noise and energy. Also, the LEDs can be dimmed to reduce light pollution when working in sensitive environments. The Drobo 5C is compatible with both Windows and Mac, including APFS/macOS High Sierra, and also includes a 5.9' USB 3.0 Type-C to Type-A cable, a 100-240 VAC power supply that runs at 50-60 Hz, and a 9.2' power cord. Protection is provided by a limited 1-year warranty within the US or outside the EU, or a limited 2-year warranty within the EU, as well as 90 days of business hour tech support. Using the 1 or 3-year DroboCare warranty renewals, your Drobo 5C is eligible for up to 5 years of coverage. The Drobo 5C protects your data from a single or dual hard drive failures. In the case of a drive failure, Drobo will immediately rebuild data using the remaining available space. In the background, Drobo performs "data scrubbing and self-healing," which means it validates your data and repairs any inconsistencies. 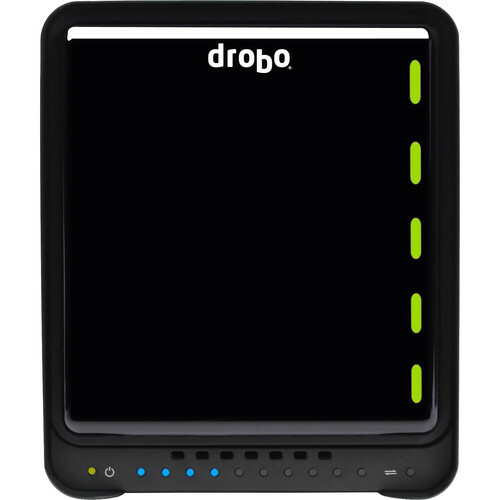 Drobo doesn't just protect against drive failures, but also from potential data loss after a power outage. 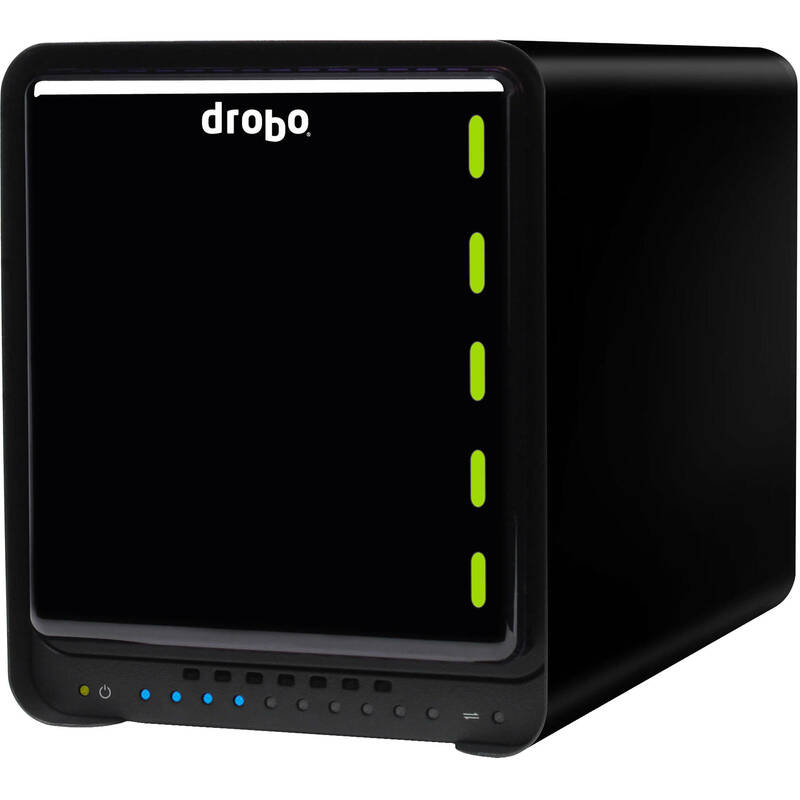 The Drobo 5C includes advanced battery backup technology that helps protects data in memory or cache. During a sudden power loss, Drobo protects in-progress operations by saving them to an internal SSD. The operations are resumed and written to the disks once power is restored. This helps ensure important information is safe and sound. The battery recharges itself and is designed to last for the life of your Drobo. The Drobo 5C supports volume sizes up to 64TB and allows for expansion into this size. You can grow in to this, and provide only the capacity you need today. When more storage space is needed, simply add another drive, or replace a drive with a larger one. Drobo allows you to mix and match hard drives of virtually any size or brand. This empowers you to buy suitable drives when you need more space, instead of paying today for capacity you will not need until the future. The Drobo 5C allows for a second, fixed volume size and limits the amount of storage space you specify for the second volume. The rest of the capacity is available for storing other files. 1. Apple's Time Machine: Specify the maximum size Time Machine can use for its versioned backups. This solves the problem of Time Machine slowly consuming all space on a drive. 2. Encrypted Hard Drive: Some information requires additional protection. A second volume can create an encrypted disk using Windows and OS X / macOS tools. Sensitive data is protected with a password. Access to sensitive data is password protected. With the Drobo 5C, 3.5" hard drives slide right into the drive bays. No metal drive carriers or assembly screws are necessary, unless 2.5" drives are being used. The Drobo chassis is constructed of metal and the magnetic front cover is easy to install or remove. Number of Bays 5 x 3.5"
Box Dimensions (LxWxH) 13.9 x 12.9 x 10.4"
5C 5-Bay USB 3.0 Type-C Enclosure is rated 3.4 out of 5 by 30. Rated 1 out of 5 by Craig from If you own a Mac, DO NOT BUY THIS I read the bad reviews and decided to ignore them and purchase this Drobo anyway. Right out of the box it was acting up. First it wouldn't recognize the USB type-c cable so I bought a new one and it wouldn't recognize that one either until I turned the cable upside down (yes, really). Then on day two I noticed that Time Machine wasn't backing up. The Drobo had stopped mounting on my Mac. Tech support suggested that I buy Disk Warrior. Seriously?! They were suggesting that I buy DW for a brand new product and drives?? I told them to close the ticket and I was sending the Drobo and drives back. This company will never get my dollars again. Rated 4 out of 5 by kc5cbt from Seems to work great, but load big drives I purchased this to backup 3 tb of photo and video files. Seems to work great and the interface is great. It is a well thought out product and built well. When I 1st got it, I loaded it with drives I had sitting around. Two 500gb drives, and a 1tb drive. I was surprised at how little space was available. But, makes sense when you think about what it is doing, allowing any drive to fail and there still be good data. So, it was planning for my largest drive to fail. I later installed two 4TB drives, two 2TB drives and now it seems much happier. I think I have almost 6TB of space for backup with single drive redundancy. Rated 2 out of 5 by Jan from Does not off the peace of mind you're looking for Since buying this a few months ago, I have spent dozens of hours troubleshooting problems with the unit. Most often from it not mounting or not appearing on the USB bus at all. Other times issues with it stalling during boot up. It's always been possible to gradually coax it back to life so far, but typically the process is completely arbitrary and far more complex than any official instructions indicate. Moreover, this has been without any disk issues; I dread to think how painful recovery would be. My intention buying it was to use it as a primary backup, but I find I cannot trust it for this purpose. I hoped it would offer peace of mind for my data, instead it constantly fails in new and unpredictable ways. Rated 5 out of 5 by Chris B. from Just what I needed I have a 2nd Gen Drobo which is still working fine but I wanted something a little faster with more capacity, so this is actually an upgrade to my previous unit. Migration was effortless. Dismount the old one, pop the drives out, put them in the new one, plug it in. I use this for HD video recordings on my Mac mini using eyeTV and a USB TV tuner, along with storing my iTunes, Photos library, games and anything else big. Speed is much better but now limited to my old Mac's USB, so now just waiting on Apple to release a new model. Also need to get a USB hub as previous Drobo was Firewire, and I'm now out of USB ports with the Drobo, TV Tuner and game controllers. Rated 2 out of 5 by Tyler C. from Stopped Mounting/Data Corrupted After just three days of owning this device, my Drobo 5C stopped mounting, and it looks like it is because my data had somehow become corrupted. Despite all indicator lights showing healthy drives and only at 30% capacity, I can't access my Drobo however, Drobo Dashboard communicates with it perfectly still. I know how to take care of these devices and understand what goes into taking care of them properly. With that, there is nothing that I can think of that I did personally that would have caused this. Also, I have been able to rule out certain things that typically cause this type of situation (i.e power outage/surge, interrupted data transfer, overheating, etc) that could have caused this. Currently still investigating with Drobo support team. Rated 5 out of 5 by John from Dependable Data Storage I had bought a Drobo Gen2 in 2009. It ran perfectly, as it was designed to do, for 10 years. I had decided to upgrade to the Drobo 5C. Naturally, I thought of B+H to purchase this item. Once I received it I did have a question about transferring the drives from the old unit to the new one. I called Customer Service, got right through and the answered my question. Not only did the Customer Rep answer my question, but he stayed on the line while I transferred the drives and added a new one for the fifth slot. He stayed on until I checked out whether I could access the data and use it in my applications. Drobo and B+H are two great companies to work with. If I don't need daisy chain, should I just go with this over the 5D? Will I see any noticeable performance improvement with Thunderbolt 3? I&rsquo;m no expert. Usb3.0 is good for 5 Gbits/s and Thunderbolt3 is good for 40. So how much speed do you need? Has Drobo started to ship this model with a USB-C cable yet? I currently am using 5 x 4TB WDC RED NAS drives with a 5,400 rpm spindle speed. Directly attached to my iMac-Pro running Windows 10 under Bootcamp, I typically see sustained transfer rates in the 220 - 240 MB/s range. My transfers are normally for video files that range in size from 3 GB to 50 GB with the volume being transferred often exceeding 250 GB each instance. When attached as a Network drive (1 GB Ethernet) thru an older Mac-Mini &amp; MS Network Software using the provided USB Type-C to USB Type-A adapter, I see sustained transfer rates that are lower (90 - 120 MB/s) depending on Ethernet loading - I have 8 security cameras recording and displaying images @ 3k in addition to three Cable TV channels that constantly pipe/upload data to the iMac-Pro with an additional down load from the network to a Dune Video player (1 channel). There are three storage drives connected to my network [1 READY NAS, 1 DROBO 5D, and 1 DROBO 5C). READYNAS normally employed for access to files randomly which need to satisfy different performance expectations. Overall, it appears as if the 5C is an excellent option for extended storage at minimal cost and it is very easy to manage. Hope this helps. I know this has a port limitation of 5gb/s, but does this also have a hardware data transfer limitation? For example, other external enclosures I have seen may have a USB 3.0, but due to its hardware, its max transfer speed is 400MB/s etc. You're definitely going to be limited by the HDD transfer speed. You can buy an M.2 SSD as a cache, and that will significantly up the throughput. May I use this model with an adapter for USB-C in the meanwhile? I'm planning on getting a newer computer later. Yes. I'm currently using my 5C with a Type A cable.If your computer uses USB 3.1, you probably won't notice any 'slowdown'. In any event, the 5C won't be any slower than anything you're using now. It just might not be reaching it's full potential until your rig supports USB-C. The 5C will work very well in the meantime. What kind of drives would you recommend using in this? Also, what size of drives would you recommend? I use the WD drives WD40EZRX 4TB. But size is up to you and is dependent on your needs. Will this accommodate a disc pack migration from a Drobo FS? I was unable to find the answer on Drobo's website. I am going to forward this question to a friend whose IT business uses big guns Drobo. Ill ask him to comment. Answered by: CAROL E B. Seems to be some confusion on drive configuration questions so I'll make this simple. Will this accommodate JBOD (i.e. 5 independent drives)? Forgive my ignorance as I know next to nothing about these. But do you have ot purchase drives separate and how difficult are they to install? Very simple to install drives and software. Instructions for each are included. 1 hour and system will be ready to accept data.